Discussion in 'Map Factory' started by Berry, May 9, 2014. KotH version here (quite different currently. once I finish it I'll reconvert). Abandoned, check my orphan thread. Pretty big sniper sightline, covering about every entrace. I (almost) never play arena, so I don't know how often this will occur in a real game tho. That's pretty much why I don't plan to make it koth. By the time everyone is out there, it's gonna be hard for a sniper to do much there. I'm willing to take the risk of seeing how interesting it could play (lowground has health advantage aswell, although that doesn't play for much). 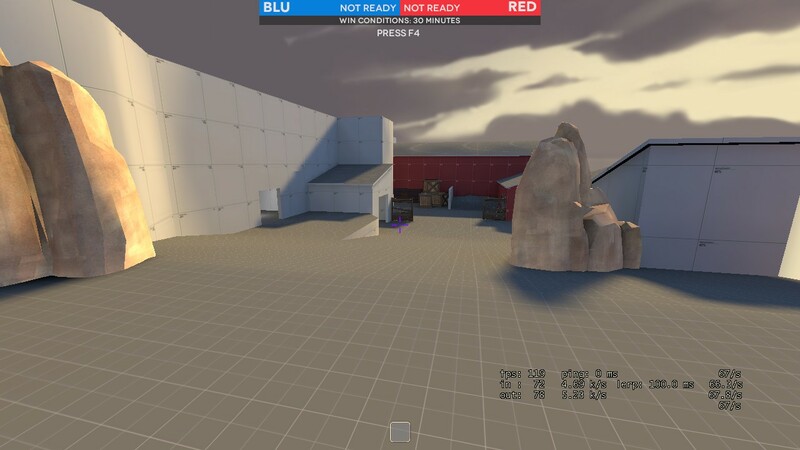 Seems quite reasonable, would definatly be a problem on a Koth map. If it is a problem, I'm sure I can just rebuild the spawns into the cliffside, and add a couple more rocks or trees or something in the way of the sightline.